This book was written as a basic guide and source book for all dulcimer players, from the absolute novice to the most advanced picker. 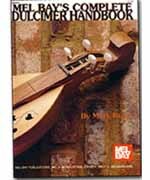 With its 53 songs in various modes and tunings, The Complete Dulcimer Handbook is meant to be used as a songbook, a lesson plan book, and a step-by-step guide from beginner to intermediate or advanced level. The author's basic premise is that, given this instrument's relatively brief pedagogical history, 'There are no right or wrong ways to play the mountain dulcimer, only harder or earsier means of reaching the same ends'.